oops, I forgot to start this off with major spoilers below. Read more to see it. So If you have not seen Inception yet, I highly recommend it. It is a fun movie that I have thought about and made jokes about and references about since I have seen it. 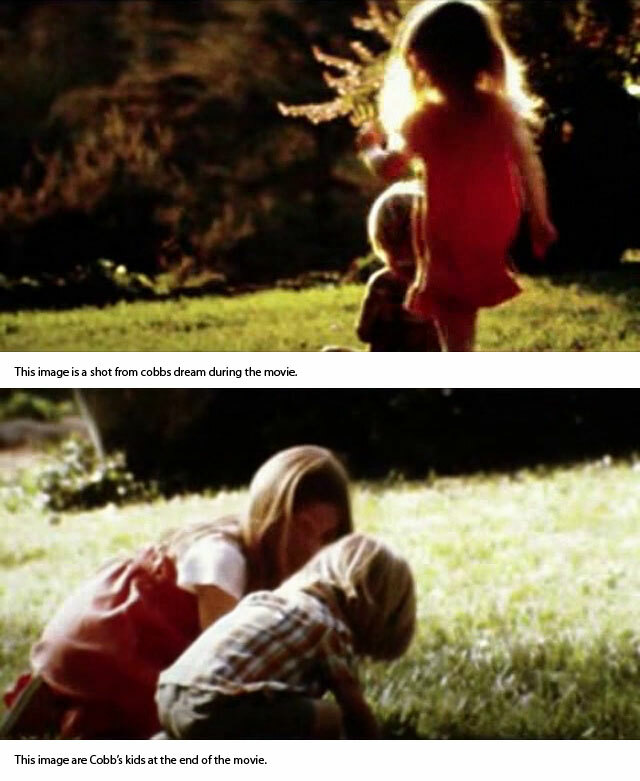 Above are two screen caps from the movie. The first one is about the time that he finished the first inception and gets a phone call from his kids. The second image is from the end after everything is done with, Just before the top sounds like it is about to topple over. After I read this article from the Costume Designer from Inception, I had to make sure myself. He says “On to the second part of your question, the children’s clothing is different in the final scene… look again…” And it is pretty accurate. Also I was reading through the message boards that supposedly two different child actors played the beginning and ending children. But I think that is pretty normal as kids can only work so much in Hollywood, and it would be easier to just hire more children. But whenever he uses the totem he is in a dream anyways? Right? So he is just no longer in limbo.